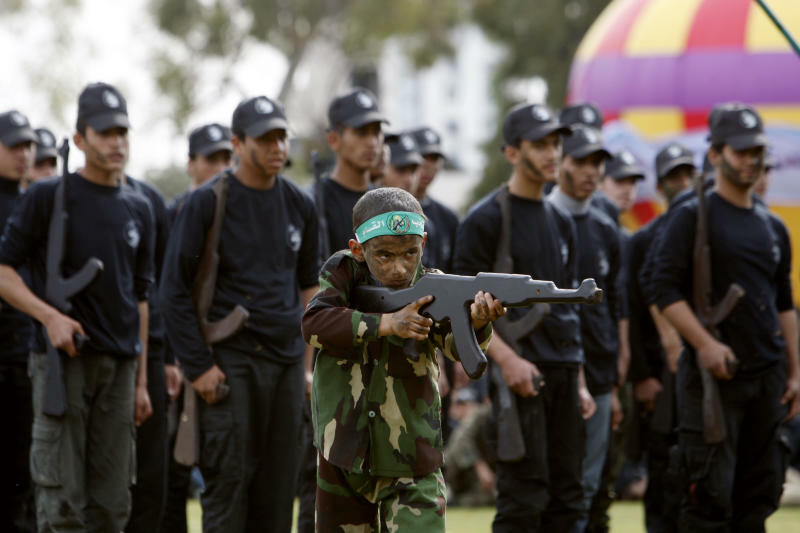 GAZA CITY, Gaza Strip (AP) — More than 3,000 Palestinian teenagers on Thursday graduated from the ruling Hamas militant group's first high school military training program in the Gaza Strip, displaying mock weapons, crawling commando-style on the ground and taking up fighting positions for thousands of cheering supporters. 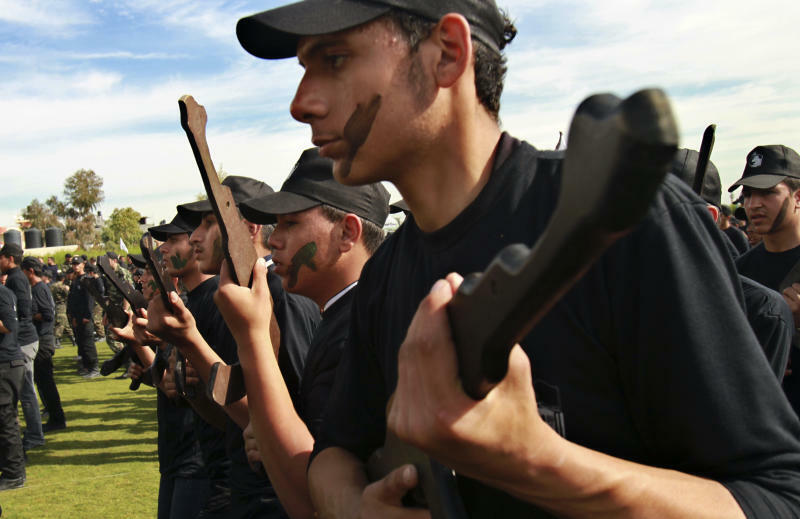 Hamas officials said the Futuwwa, or "Youth," program is aimed at fostering a new generation of leaders in the struggle against Israel. "We teach the youth to honor the national flag and anthem, to strengthen their affinity with the homeland and Jerusalem, the spirit of resistance and the principles of steadfastness," said Abu Hozifa, a 29-year-old national security officer who teaches in the program. "We also prepare them in terms of faith and physical fitness to serve as resistance fighters if they want to be in the future." The program is a weekly elective that is offered in all Gaza high schools. Officials said 3,600 participated in the first session, which began in September. During the one-hour session each week, students were taught to climb down buildings on ropes, jump through obstacle courses and crawl under barbed wire. The oldest students are trained to use light weapons, while younger ones train with wooden rifles. Each participant is assigned to a security officer who oversees their training. The first graduates, called the "Liberation Vanguards," were dressed in black T-shirts and hats, and some painted their faces black. "My officer taught me the values of courage, sacrifice and love of jihad, as well as some battle tactics," said Radwan Wasfi, 15, whose black-painted face dripped with sweat after going through a drill. "I feel that I can free my energy in a good way. I can do for real what I do in video games." Hamas' prime minister, Ismail Haniyeh, who attended the ceremony held at a soccer stadium, said he had ordered his education minister to establish a full-time military college to open next September. "This is the generation that will bring victory to its people and will liberate their land," he told the audience. Hamas, an Islamic militant group sworn to Israel's destruction, seized control of Gaza from the rival Fatah faction of Palestinian President Mahmoud Abbas in 2007. The group has survived repeated bouts of fighting against Israel, most recently an eight-day flareup of heavy violence in November in which Hamas fired more than 1,500 rockets into Israel. The fighting ended in an Egyptian-brokered cease-fire. Repeated attempts by the rival Palestinian factions to reconcile have sputtered.